It is more than 500,000 years, since the Man was established in the valley of "La Creuse Tourangelle". This occupation is confirmed by the discovery of many cut flint tools. The end of the Neolithic era is realised by megaliths. In the first centuries of this era, our town was called Haya , which means "hedge" in Latin. The finding of numerous vestiges' and the remainders of a paved Roman road, testifies the important activity at the time Gallo-Romaine era. In the Middle Ages, Haya became La Haye en Touraine. It did not have more than one simple châtellenie whose first known lord was Adelande. Foulques Nerra or its descendants build a strengthened castle, it seems one of the ten was first built out of stone, and built before the year 1000. La Haye became a baronnie thereafter. This was transmitted, generally by alliance, at various Houses and was sold in 1555 to the Family of Rohan. A powerful seigniorial castle it does not remain, today, but the vestiges of the feudal mound and the dry ditches do. During the wars of religion, La Haye had to undergo several sieges and was the theatre of rough battles. Conquered by the Protestants in 1566, the city was taken quicky again by the Viscount of Paulmy. Born on March 31st, 1596, René Descartes was baptized in the church Saint Georges a few days later. Located a long time on the road towards Spain, the town accommodated the pilgrims who where heading towards Saint-Jacob de Compostelle, and the town also saw some passing royal processions. The city lost of its influence from 1750 onwards when it was decided to follow the route Tours - Sainte Maure - Châtellerault. During the Revolution, La Haye en Touraine hid from many things with respect to the national events and in spite of the particularly intense activity of the Popular Company, a branch of the Jacobins, which was directed a long time before by Jean-Baptiste Brung. It is at that time, in February 1794, he was permitted to baptize the commune La Haye - Descartes . The authorization arrived the 10 Vendémiaire XI year (October 2nd, 1802). April 14th, 1867, Rene Boylesve was born in the town. He would later become a novelist and a member of the French Academy. In the middle of the 19th century, under the preasure from the printers of Turns, paper mills and boardings were established at the edge of the Creuse; there was twinned hydraulic power and a railway was installed between the river and the secondary road no. 750. La Haye - Descartes felt the effects of the Second world war. From 1940 to 1942, it was on the Line of demarcation . The bridge was destroyed in June 1940 then again in August 1944. Several maquis were devoted to activities of Resistance in the Area and took part in the release of the town in September 1944. 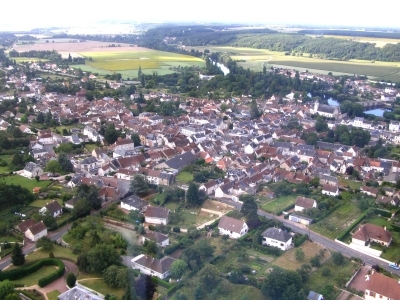 The city was called successively Haya, La Haye en Touraine, then La Haye - Descartes, and since his fusion with the neighboring district of Balesmes, in 1967, the town was called DESCARTES according to the patronym of the Descartes philosopher. In the Place l'Hotel de Ville , a statue bearing the effigy of René Descartes was constructed in 1849, by Nieuwekerke, cast at the foundry of Abilly. The slogan of the town of Descartes is: "Of gold to the simple facard charged with three turns of money, built of sand".